How long has it been now? It seems like the last star date was light years ago, that a franchise that had been a cultural mainstay for decades had finally drifted into its final frontier. As the leagues of Trekkies grew older, it seemed that the obsession and admiration for Gene Roddenberry’s benchmark science fiction work would soon die out but one Trekkie would not hear of it. 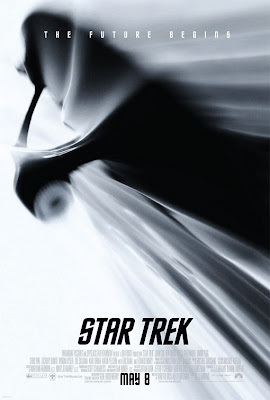 J.J. Abrams, the man responsible for creating a new faction of avid followers with his twisted series, “Lost”, stepped up to bring STAR TREK to this generation. The trick then became how to sell these classic characters to an audience that may widely know them solely as punch lines or wax statues while not shunning those who watched religiously and have had to wait seven years for a new installment. Abrams must be a master trickster then because his reboot feels alive and energized from start to finish. While making a movie to appease particular crowds, both new and old, Abrams has instead made a STAR TREK film everyone can get into. I never cared much for the original “Star Trek” series and I was only a casual viewer of “The Next Generation”. I have nothing against Trekkies but I most certainly am not one. And I also admit that the thing I was most curious about this film was how Abrams could make STAR TREK relevant again. He did it by owning it. From the very beginning, STAR TREK dives into intense drama. A Starfleet ship is under attack by a rogue Romulan ship that appears out of nowhere and looks like a tentacled mechanical monster. People are dying all around and the situation is grim but the result is instant immersement in an alternate reality that is unfathomable and yet entirely convincing. We proceed to bounce back and forth between Iowa and the planet, Vulcan, as if they were mere minutes apart. Beings, both human and alien, exist in both plains seamlessly and it suddenly isn’t so difficult to relate. Even Michael Giacchino’s score is triumphantly, boldly proclaiming a resounding pride for the project as a whole. STAR TREK makes no apologies for what it is and no concessions to be here now. Roberto Orci and Alex Kurtzman’s screenplay is surprisingly concise given their studio background. They were faced with the challenge of reintroducing characters that are cultural icons without desecrating their origins. The truth is that bringing the whole cast of characters from the original Enterprise as is could never work today. They are simply too dated to keep up with today’s pace. And while their new incarnations are much more limber, they also have their original values (and a few hilarious catchphrases) in tact. And Abrams did a fine job weaving the old and new into his fresh cast. Captain Kirk (Chris Pine) is a cocky self-assured womanizer but Pine plays him with a well-hidden insecurity in the back of his head as to what he truly can accomplish. Ohura (Zoe Saldana) is a beautiful and fiercely intelligent woman on a mission to succeed. And Mr. Spock (Zachary Quinto), the child of a Vulcan father and a human mother, is the most fascinating of them all. Quinto strikes the perfect balance of internal turmoil between honouring his Vulcan roots and indulging his human emotions. Perhaps most important though, the cast just seems to be enjoying every second of their time on deck. Maybe I should just have a little more faith in reappropriating the past. This is the age of the geek after all so it shouldn’t be so surprising to see this resurgence now. I haven’t discussed the plot because it simply isn’t necessary. Suffice it to say, it is intricate and tight and a lot more fun not to know where anything is going at any point in time. It is such a smooth ride that you can just sit back and enjoy the comfortable warp cruising speed. I didn’t think he could do it but J.J. Abrams has boldly brought STAR TREK where no STAR TREK film has ever gone before … past the niche and to the masses. How many sheep would you give Star Trek? I disagree that the original cast of characters wouldn’t make the transition into modern cinema. Good characters are timeless. Sure, the re-boot is going in a different direction to the original films. But that’s a choice that the production staff have made and not a inevitable consequence of the out-of-date nature of the original franchise. I actually think that the technology is what makes Star Trek so perfect for this time in particular. Now it can genuinely look futuristic instead of hokey. The characters are reasonably timeless though as they seem to have kept much of what they essentially were to begin with.